Suburban Rail System is for providing a transport option for travelers/commuters between business/industrial center and far of populated areas. Suburban trains also a combination of Electric Multiple Units. BEML started manufacturing of wide body EMUs from the year 1994 onwards especially meeting the requirements of Indian Railways’ suburban operations. In the beginning, 63Nos. wide body EMUs were supplied for operating in 1500V DC type electrified routes of Mumbai suburban area. Later, in order to meet the requirement of upgraded/new 25kV AC type electrified routes of suburban zones of New Delhi, Chennai and Kolkata, over 500 Nos. 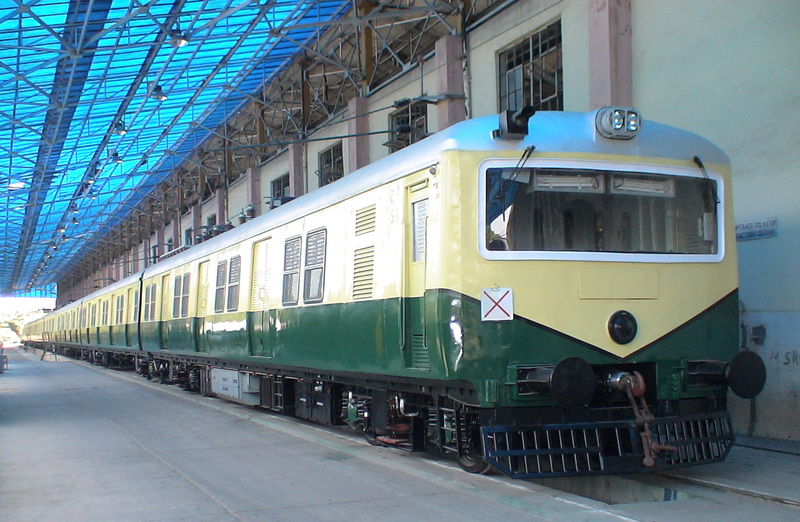 wide body EMUs were manufactured and supplied to Indian Railways in the early phase. During the last decade, about 400Nos. wide body EMUs have been supplied. These EMUs can be operated at maximum speed of 105KMPH.Each set consists of 1No. motorized coach and 2Nos. non-motorized coach. The combination of these sets in 2/3/4 etc., will form single train depending upon the operating requirements. With the experience and expertise gained in Metro Car manufacturing, BEML has designed, developed and commissioned 6 trainsets (9-car each) ergonomic stainless steel coaches for Suburban railway transit. Stainless steel being lighter than carten steel and maintenance free, these coaches are energy efficient, requires almost no rework on the shell during periodic maintenance and lastly due to non use paint it is environment friendly. BEML also, has executed the contract for supply of 160Nos.Diesel EMUsfor operating in non-electrified routes of Indian Railways for mainline routes and has maximum operating speed of 110KMPH.Each set consists of 1No. powered (1400 HP) & motorized coach and 3Nos. trailer coach. The combination of these sets in 2/3/4 etc., will form a single train depending upon the operating requirements. Recently, BEML also has manufactured and supplied 72Nos. Mainline EMUs which can be run at maximum speed of 110KMPH for operating in 25kV AC type electrified mainline routes of Indian Railways. Each set consists of 1No. motorized coach and 3Nos. non-motorized coach. The combination of these sets in 2/3/4 etc., will form a single train depending upon the operating requirements.